Mouse and mole repeller «Grad A-550US» is an extremely effective device, guaranteed to protect your household/house from invasion of mice, rats, moles and shrews. If pests have already occupied your household's territory, several weeks (or even days) would be enough to clear the territory from «intruders». Ultrasonic repeller makes it impossible for mice, rats and moles to continue to stay in the protected area, still the device is absolutely harmless to humans and pets (exceptions are hamsters, pet rats and so on). 1. Large protection range - up to 550 square meters (5,900 sq.ft.). Such an astounding range is possible by virtue of transducer's increased power and upgraded algorithm ultrasonic radiation. The device is appropriate for repelling pests both in small and large areas. The smaller the area, the higher effectiveness of the device will be because then all of the repeller's power is concentrated on small volume. 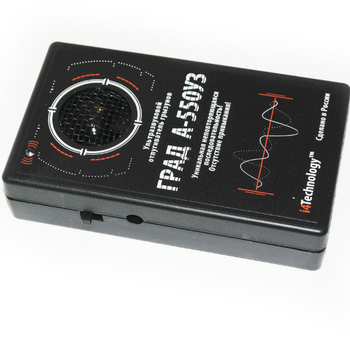 Unlike most similar devices, «Grad A-550US» produces no audible sounds! This has to do with the fact the repeller uses ultrasound which doesn't affect people. 3. The device effectiveness doesn't decrease with time because pests cannot adapt to the unique nonrepeating sequence of ultrasound. Laboratory experiments on pests show that prolonged exposure to unaltered frequency gradually loses effect on pests and they stop perceiving it as a signal to escape. 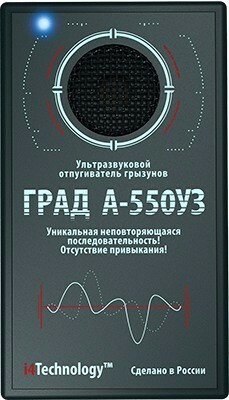 However, «Grad A-550US» uses unique nonrepeating sequence of ultrasound which has no addictive effect on mice, rats and moles. Thus the device will protect your territory for many years. Also it works without "blind spots", zones where pests can hide. 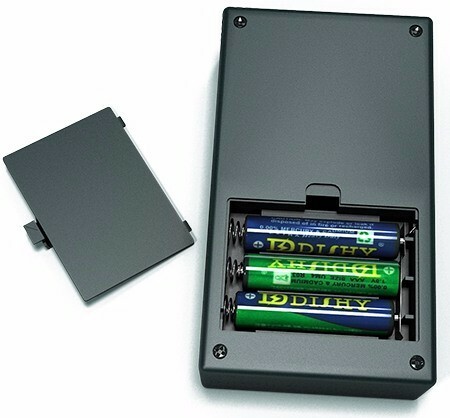 «Grad A-550US» can operate not only from electrical power supply of 220 V but also from alternative supply (AAA type batteries, extraneous source of direct-current 10-30 V, for example a car battery). By virtue of variety of power sources, the device can be used almost everywhere: in unelectrified places (sheds, basements, cold cellars), outside, underground (for repelling moles). However, it must be taken into account that when the device is powered from batteries, emitting strength automatically decreases (it needs to save battery's charge). The repeller's housing is made of shatterproof plastic making the device resistant to physical impacts (drops from a short height, minor to average hits). 6. Operation at the widest range of temperatures. 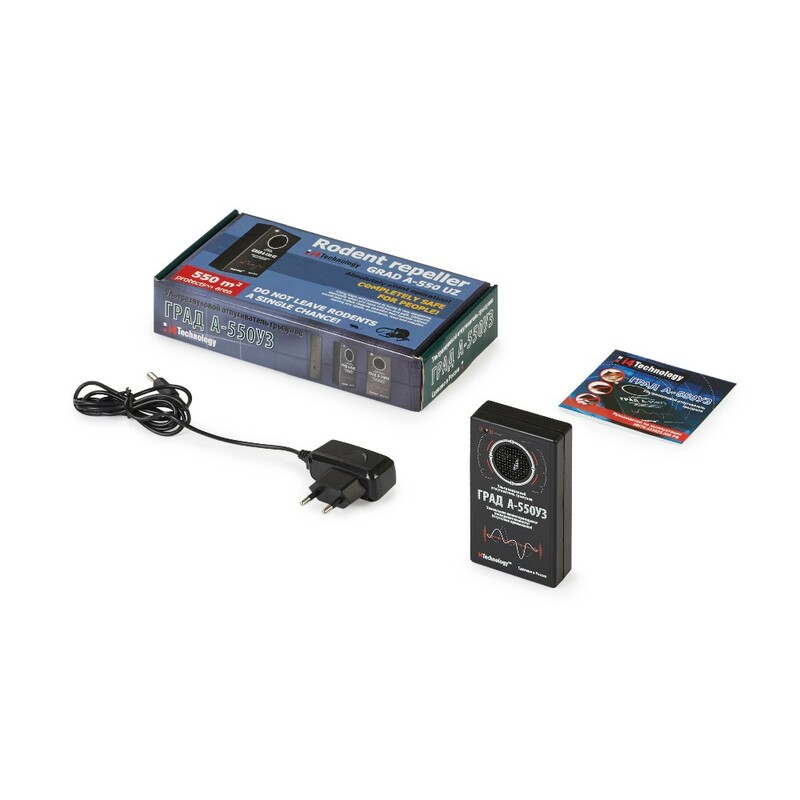 The repeller requires no special pre-operation adjustments or settings. It is very simple in use. The device should be installed in the center of compartment at a height of 60 - 70 cm (23,6 - 27,5 inches) from the floor surface. The device can be also hung to a wall.